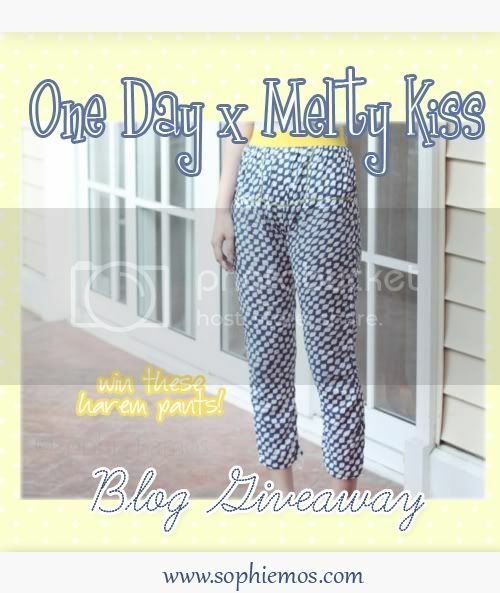 One Day x Melty Kiss Blog Giveaway! One giveaway ends, another one opens! Yay! I’m giving away not 1, not 2, not 3, but FOUR comfy stylish harem pants (2 black & 2 blue) from Melty Kiss! 1. Like One Day AND Melty Kiss on Facebook. 3. Follow me AND Melty Kiss on Twitter and tweet: “OMG! I want to win those stylish harem pants from @meltykisser at www.sophiemos.com! ” No need to tag me! Make sure to set your twitter accounts on public so that I can verify the tweet. +5, post this as your Facebook status: “WANT free stylish harem pants from @meltykiss? Check out @One Day to win amazing prizes! www.sophiemos.com” Make sure you tag One Day AND Melty Kiss Also make sure your account is set on public, so that I can verify it.